Free resource guide: 10 career websites every PhD should visit! To help showcase the fantastic range of careers PhDs are pursing these days, I’ve put together a resource guide listing my top 10 post-PhD interview websites. Click on the link below to download your free copy. Please share it with your peers and send a copy to your university careers service – and to your supervisors! E-book; 124 pages; available to download from www.selloutyoursoul.com. In this book James Mulvey absolutely nails the predicament felt by many thousands of arts and humanities graduates each year. These folks have spent 3 years delving deeper into subjects that they love and are passionate about, determined to push themselves and the boundaries of knowledge further. They’ve written smart papers, won prizes, got good grades, seemed destined for great things, maybe gone on to study at postgraduate level. Underlying this success is the unspoken assumption that all their efforts will pay off and lead to great jobs after graduation. However, as many jobless arts and humanities students know to their cost, the harsh reality is that it doesn’t always work out this way. We all know humanities BAs who have ended up labouring in dead-end jobs to make ends meet, wondering where it all went wrong for them. James’ diagnosis of this situation is that it’s not the jobseeker who has failed – it’s the higher education system itself that has failed humanities graduates. Universities rightly focus on teaching academic skills, as part of getting to grips with a body of academic knowledge (you went to study a subject after all!). However, this emphasis on academic competencies means that a bright student can leave university well-equipped for the interpretation of lyric poetry for instance, but totally lacking the practical kinds of skills required for jobs in business and the public sector. This mismatch explains the predicament affecting so many of today’s arts and humanities graduates, compared with their peers taking more vocational subjects – they can spend months, if not years, in the ‘wilderness’ before finding a decent job. The time spent in a dead-end job can be painful, not only in financial terms but also in personal terms: high-flyers who are used to academic success can struggle to deal with a lack of prospects and feelings of failure. For postgrads too, competition for academic posts is extremely fierce, and so as more and more MAs and PhDs enter the mainstream job market (either by choice or by necessity), they also need help in communicating their value to employers. This is where James’ clear 126-day programme comes into its own. Beginning with the sound advice to define yourself by what you can do (for an employer) rather than who you are (a humanities graduate), the emphasis at all times is on developing a practical and marketable set of skills, rather than relying upon your degree alone to get you a job. James’ key advice is to decide upon a target area of work and then set yourself some relevant goals each month, taking small but significant steps towards achieving these goals each week. For instance, if you want to break into magazine publishing, then your monthly goals might be: learn about the publishing industry; write some articles; put together an online portfolio; and send in 3 letters of application to publishing companies. James provides all the guidance and tools that the reader needs for their chosen strategy, with the core components being a Monthly Goal Chart and a Weekly Productivity Chart – you can feel your confidence rising even before you start to fill them in! So whilst their competitors sit at home firing off application after application based upon their past academic achievements, in search of that elusive ‘good job’, followers of Mulvey’s method will be growing their practical skills week after week, and learning what works through trial and error. At the end of a couple of months, the candidate who has spent their time and energy getting to grips with the practicalities of a specific industry will have the edge over their purist but out-of-touch peers, as the contrasting cover letter examples in the book wryly illustrate. As someone who personally made a successful transition from a post-doc research position into a business career, so much of what James sets out in this book rings true with my own experience. What definitely helped me in breaking out of academia was identifying a target industry, understanding the typical skills and knowledge required in that industry, and then relentlessly developing my own skills and knowledge by reading, practising, applying for jobs, failing and picking myself up again, until I finally got my job offer some months later! The effort that I’d invested in learning about my target industry definitely paid off, as my practical skills complemented my academic skill-set and showed that I would hit the ground running. The big problem with academics is that they often don’t think of themselves as changing careers. They see themselves as ‘finding work outside of academia with a PhD.’ This is a mistake because the reality is there is no work for PhD’s outside of academia. There are just some jobs that a PhD could be good at. In other words, you need to stop thinking of yourself as a PhD looking for work. You need to stop talking about yourself as a PhD looking for work. Instead, you need to talk about yourself as a researcher, analyst, and writer looking to switch careers from academia into private industry. In a couple of sentences James neatly sums up the key shift in mindset that the PhD looking for a non-academic job needs to make. Once you appreciate that the transition from academia to business is 90% continuity and 10% self-promotion and re-skilling, rather than 100% ‘failure’ and starting from scratch, your successful mainstream career is just around the corner. Given the reasonable price-tag and the 100% money-back guarantee, this has to be the best-value careers guide humanities graduates can buy! 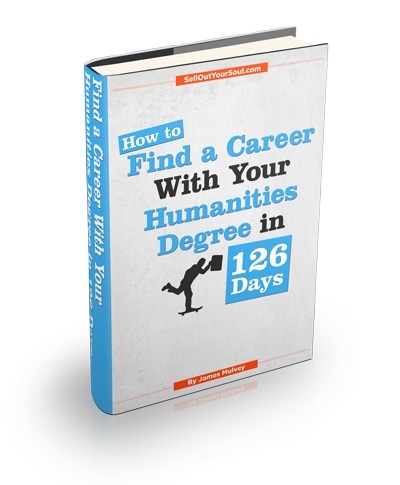 Find out more and buy a copy of How to Find a Career With Your Humanities Degree.